CleanBench™ is the next generation of our industry standard 63 series lab tables. TMC's vibration isolation lab tables lead the industry in performance and are ideal for a wide variety of applications including AFM, Confocal Microscopy, IVF, Patch-Clamping, Interferometry, and Metrology. 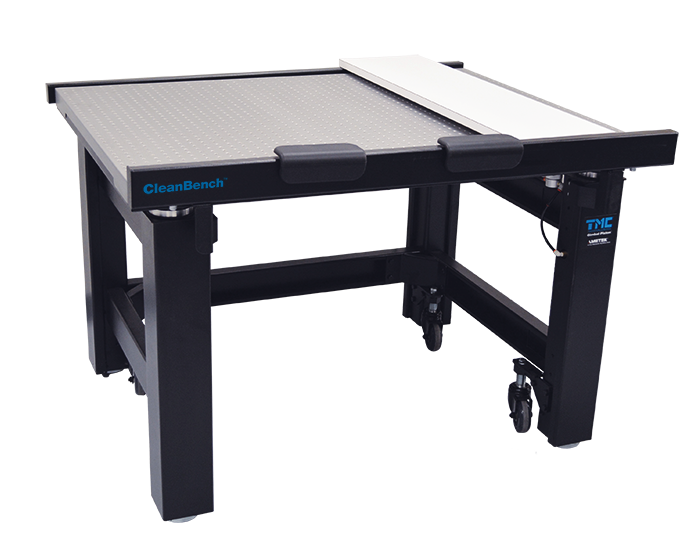 CleanBench incorporates TMC's unique Gimbal Piston Vibration Isolators and a tabletop with enhanced performance and features. Unique new table-top design (patent pending) combines the best features of TMC's CleanTop steel honeycomb tops with our ultra-stiff, damped, layered platform design. Guided thread lead-ins to align screws with tapped holes. The "bevel" shape eases engagement of the first thread. Ergonomics optimized for the seated user by minimizing the thickness of the table-top. Other designs either offer 100 mm, 4 in. thick tops which awkwardly separate knees and elbows or sacrifice essential mass by offering a 50 mm, 2 in. thick honeycomb top which does not have adequate massfor effective vibration isolation, especially for smaller table sizes. Ergonomics optimized for the seated user by minimizing the thickness of the table-top. Other designs either offer 4" (100 mm) thick tops which awkwardly separate knees and elbows orsacrifice essential mass by offering a 2" (50mm) thick honeycomb top which does not have adequate mass for effective vibration isolation, especially for smaller table sizes. Thin-Wall Rolling Diaphragms — An integral part of the Gimbal Piston, the thin-wall, dacron-reinforced, rolling diaphragm air seals are only 0.020 in. (0.5 mm) thick and extremely flexible. They do not stiffen the spring as thicker rubber diaphragms do. Aluminum Height Control Valves — All systems are equipped with rugged aluminum height control valves. Virtually unbreakable, they are finger adjustable with no need for tools. The standard model maintains height to ± 0.050 in. (± 1 mm); the precision model, to ± 0.005 in. (± 0.1 mm). Internal Piston Travel Restraint — Unique in the industry, TMC provides husky, tamper-proof, built-in piston travel restraints. The restraints are completely independent of the table valves and have been ram-tested at forces above those produced by the pistons operating at full pressure. They cannot be decoupled accidentally and do not interfere with setting up and using the table, but simply protect against overtravel without the use of external bars that create hazardous pinch points. Heavy loads, including the top plate, can be safely removed from a table in full operation. Rugged Built-in Leveling Feet — Table legs include built-in fine-thread 3 in. (75 mm) diameter screw jack levelers with 1/2 in. (13 mm) travel, provision for external adjustment, and a handy adjustment wrench. The base is a solid, slightly domed shape to assure solid, wobble-free contact with sloping or irregular floors. CleanBench is offered in an economical leveling mount option with rugged, adjustable jack screws that provide +2 1/2 and -0 in. (+62 and -0 mm) of travel. Later, you can upgrade the system to full vibration isolation performance, with a total cost only slightly more than if you had opted for this feature originally. Ergonomics optimized for the seated user by minimizing the thickness of the table-top. Other designs either offer 4" (100 mm) thick tops which awkwardly separate knees and elbows or sacrifice essential mass by offering a 2" (50mm) thick honeycomb top. Tiebar Gussets — Exclusive TMC tiebar gussets increase table frame rigidity. They compensate for the elimination of the front tiebar in order to provide kneewell space. Rugged Built-in Leveling Feet Table legs include built-in fine-thread 3 in. (75 mm) diameter screw jack levelers with 1/2 in. (13 mm) travel, provision for external adjustment, and a handy adjustment wrench. The base is a solid, slightly domed shape to assure solid, wobble-free contact with sloping or irregular floors. Superior Table Tops — Our standard laminated tops provide an attractive stainless steel ferromagnetic working surface with highly damped, high stiffness construction at low cost. For applications requiring the ultimate stiffness and damping or mounting holes, specify our patented CleanTop® II honeycomb top. Structural Damping determines how quickly an excited resonance in a table top decays. The simplest way to measure damping is to hit the table top with a hammer and measure the decay with an accelerometer and oscilloscope or spectrum analyzer. The height of a resonance peak in the "compliance curve" also measures damping. All CleanBench tables incorporate TMC's Gimbal Piston Air Isolators as a standard feature. The Gimbal Piston has consistently shown to out-perform other air isolators in side-by-side testing. It offers outstanding low frequency vibration isolation in all axes and maintains its performance specifications even when subjected to extremely low input levels of excitation. Proprietary damping techniques allow the Gimbal Piston to stabilize relatively top-heavy payloads and quickly dissipate disturbances of the isolated table top. Setting up a CleanBench™ lab table. Instructions on how to install various CleanBench™ accessories. Using the OnTrack™ accessory to easily unpack and setup a CleanBench™ lab table. 4 Requires Front and Rear Support Bars. Not compatible with Perimeter Enclosure or Faraday Cage.